The bani & hymns of Guru Granth uplift the spirit and inspire the heart of the listener. 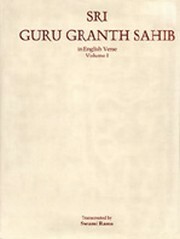 Guru Granth Sahib now represents the embodiment of the Gurus themselves. “His tray of lapis forms the sky where sun and moon as lanterns lie; Like precious gems the stars are strewn upon His tray beside the moon. The perfume of the scented trees is carried by the gentle breeze And blossoms of the earth adorn His holy feet, the One unborn." Swami Rama was born Brij Kishore Dhasmana, to a Northern Indian Brahmin family and became lineage holder of the Sankya Yoga tradition of the Himalayan Masters. He was raised in the Himalayas by his master Bengali Baba, and, under the guidance of his Master, traveled from monastery to monastery and studied with a variety of Himalayan saints and sages, including his grandmaster who was living in a remote region of Tibet. From 1949 to 1952 held the prestigious position of Shankaracharya of Karvirpitham in South India. After returning to Bengali Baba in 1952 and many years of further practice in the Himalayan caves, Swami Rama was encouraged by his teacher to go to the West where he spent a considerable portion of his life teaching, specifically in the United States. Swami Rama is especially notable as one of the first yogis to allow himself to be studied by Western scientists. In the 1960s he allowed himself to be examined by scientists at the Menninger Clinic who studied his ability to voluntary control bodily processes (such as heartbeat, blood pressure, body temperature, etc.) that are normally considered to be non-voluntary.